Enter a Cost Element Group title: CEG _ _ and click enter. Next enter your Cost Element Group name, type Cost Element Total for _ _ _ _ in the description box. Click the Lower level box. 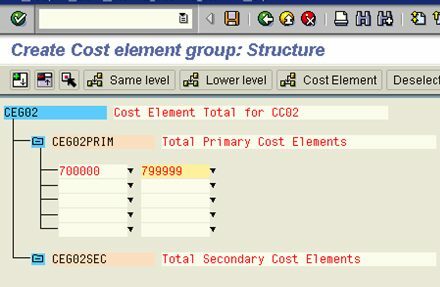 Enter CEG _ _ Prim as the title to create the primary cost element group. Type Total Primary Cost Elements as the description. Click the same level button, and type CEG _ _ Sec to create the secondary cost element group. Type a description identifying the secondary cost element. Select CEG _ _ Prim, and click the cost element button. Enter interval range 700000-799999. Click enter. Select CEG _ _ Sec, and click the cost element button. Enter interval 800000-899999, and click enter, and then save.